COBRA’s first ever connected set of irons will improve your game. 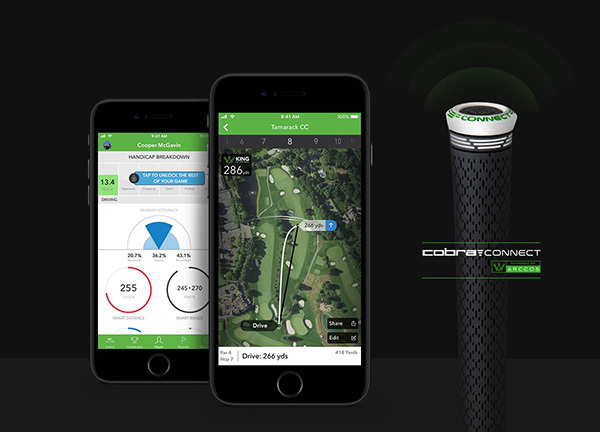 COBRA CONNECT™ Powered by Arccos, an electronic shot tracking system, allows you to track your performance so you can dial in your iron game and make smarter, data driven decisions on-course. A thinner, high-strength steel forged face increases deflection for faster ball speeds and increased distance. V-Grooves on the (3-6) irons reduce spin, U-Grooves on the (7-PW) optimize spin, and tighter, wedge spaced grooves on the GW-SW deliver extra spin for more precision around the green. COBRA’s most durable satin black finish ever, DBM (Dimonized Black Metal) provides extreme resistance to wear for longer lasting, better looking irons. High-density tungsten weights are positioned on the heel and toe of the clubhead for a lowered and centered CG that delivers more precision and forgiveness across the face.